Excess fat under the chin and in the neck area, often referred to as a “double chin,” can be unsightly and gradually forms as one ages. Whether attributed to diet/exercise or heredity, it can be extremely difficult to reduce or diminish the appearance of a double chin on one’s own. Kybella® is designed specifically to treat this area. The body possesses naturally occurring fat cell absorption through deoxycholic acid. 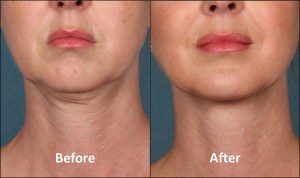 Kybella is an identical FDA approved noninvasive drug that can be injected to help reduce the appearance of submental fat aka the double chin. At Elan Medical Spa, our trained staff of aesthetic professionals have been helping to transform the lives of people in the greater Bay Area one appointment at a time. In just one or two procedures, you could be looking as young as you feel. To learn more about whether Kybella is right for you, schedule a consultation at Elan Medical Spa today.